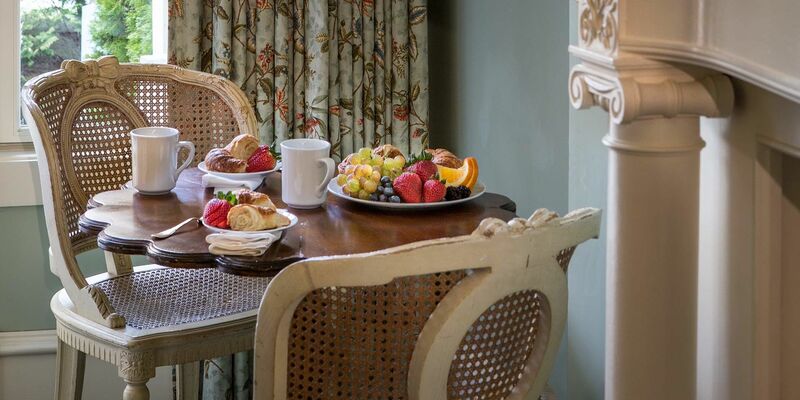 The English Trellis Garden Villa in Newport is our only room with two queen-sized, full-canopied iron beds. This room can accommodate more than double occupancy, so it is the ideal choice for traveling families or for friends. 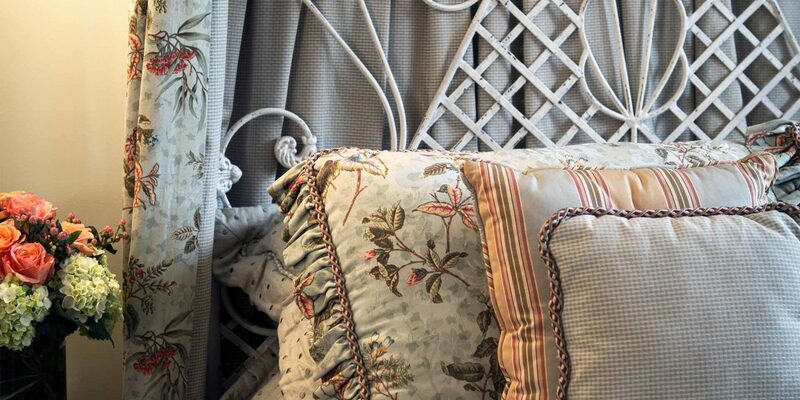 Find yourself immersed among antique furniture and trellises characteristic of an English garden. 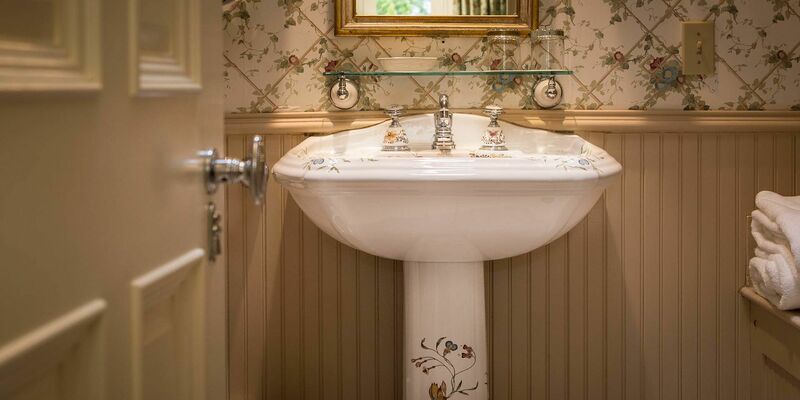 These accommodations in Newport, RI also feature a sumptuous marbled bath and a private hot tub within your courtyard. The English Trellis Room has a short staircase to climb to get onto the deck with an entrance to the room. Take yourself back to the romantic Gilded Age in Newport, Rhode Island. And start your vacation with a relaxing stay in your very own garden villa. Check in time is 3:00 p.m. Check out time is 11:00 a.m. Tax: All room rates, unless otherwise noted, are subject to 13% tax, include a 7% state sales tax and 6% city occupancy tax. Tax rates are subject to change should any government agency adjust these rates. Newport Tourism Assessment Fee: In support of the Tourism Marketing District Authority of Newport, hotels with 20 rooms or more must implement a $1.00 per room per night fee. Room Assignments: Should your reserved room become unavailable for reasons beyond the hotel's control (i.e. 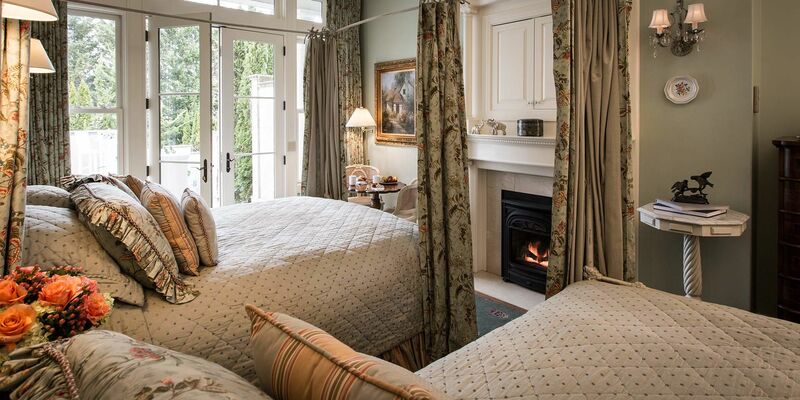 unforeseen maintenance or computer malfunction), The Chanler reserves the right to alter room assignments into guest rooms within the same category or higher for no additional fee. You will be notified immediately in the unlikely event this occurs, and we appreciate your understanding due to the intimate size of our hotel. Pet Policy: Pets are not permitted at The Chanler; however, we would be more than happy to recommend a local kennel. Smoking Policy: The hotel is 100% smoke free. A $250 cleaning fee will be charged to the guest's account should smoking occur inside the facility. Rollaway Beds: A rollaway bed can be added in your guest room at a cost of $50 per stay. DRESS CODE: The dress code at Cara is business casual at a minimum. Jackets are requested, but not required. CHEF'S TABLE & PRIVATE DINING: Reservations are not accepted online for our Chef's Table or Private Dining Room experiences. Please call the restaurant at 401.847.2244 to reserve one of these experiences. GROUPS: Our dining room can accommodate parties of up to 10 with advance notice. For groups larger than 10, we kindly ask you to arrange your dining experience through the sales department to custom create your menu and experience. Group sales may be contacted by calling 401.847.1300. RESERVATIONS: Seating begins at 5:30pm. The last seating is at 9:00pm. Reservations are highly recommended to ensure a table is available on the evening of your choice. Early arrivals and late departures are subject to availability on the day of arrival or departure and may impose a fee. Please contact the Front Desk for early arrival and late departure requests. Reservations with arrival date Oct 1 to May 14 require a 50% deposit of the total cost of the stay at the time of booking. Reservations with arrival date May 15 to Sept 30 require a 100% deposit of the total cost of the stay at the time of booking. For reservations from October 1 to May 14; any cancellations received within 14 days of arrival, no shows, or early departures are subject to a fee equal to the amount of the deposit required at the time of booking. Any cancellation from time of booking up to 14 days prior to arrival will result in a full refund of the deposit minus a $50 administrative fee. For reservations from May 15 to September 30; any cancellations received within 30 days of arrival, no shows, or early departures are subject to a fee equal to the amount of the deposit required at the time of booking. Any cancellation from the time of booking up to 30 days prior to arrival will result in a full refund of the deposit minus a $50 administrative fee.